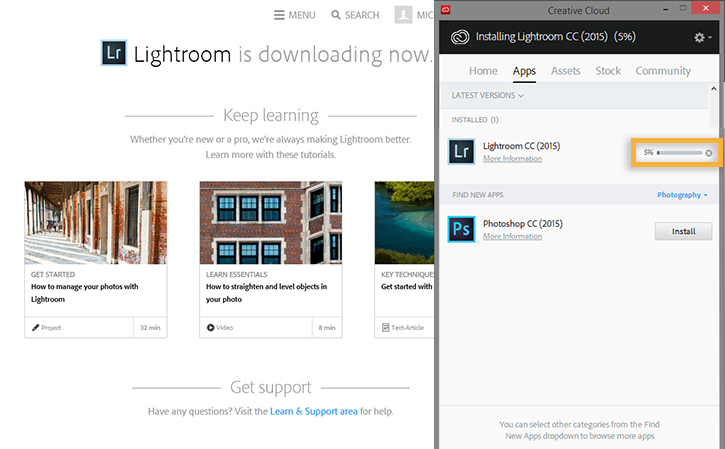 Download and install Photoshop Lightroom CC and previous versions as part of your Creative Cloud membership. Welcome to Lightroom CC. 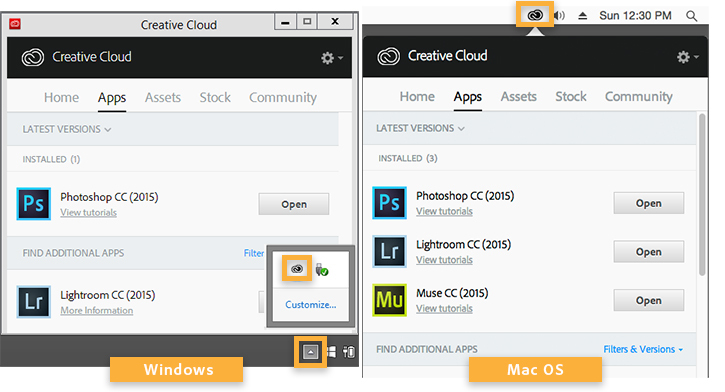 Whether you purchased a Creative Cloud All Apps or Photography plan, the process is the same. Simply download Lightroom from the adobe.com website and install it on your desktop. 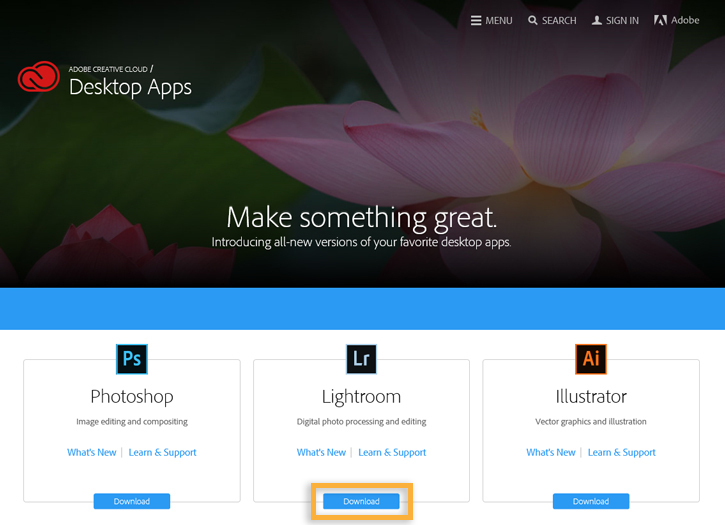 Go to the Creative Cloud apps catalog. Locate Lightroom, and click Download. If you are not signed in, you will be asked to sign in with your Adobe ID and password. Follow the onscreen instructions. If you have a free trial subscription to Creative Cloud, please refer to Download and install a Creative Cloud trial. Your app begins to download. 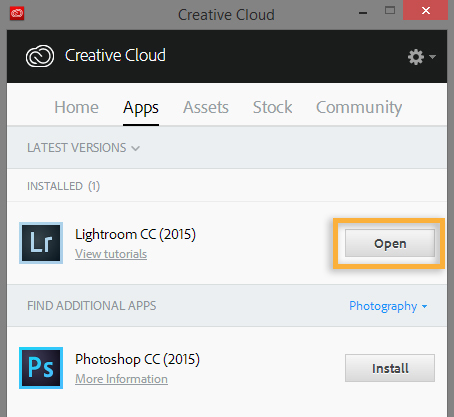 At the same time, the Adobe Creative Cloud desktop app appears, and it manages the rest of the installation process. Check your download progress in the status bar next to the app’s name. 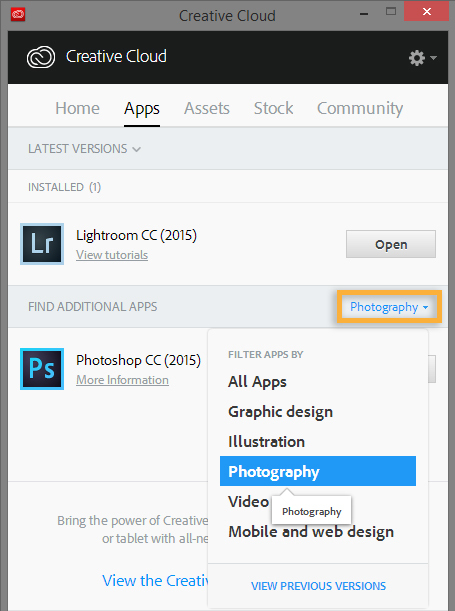 To launch your new app, find the Lightroom icon in the Apps panel and click Open. You can also launch Lightroom as you normally launch any app on your computer. Lightroom is installed in the same location where your applications are normally installed, such as the Program Files folder (Windows) or the Applications folder (Mac OS). 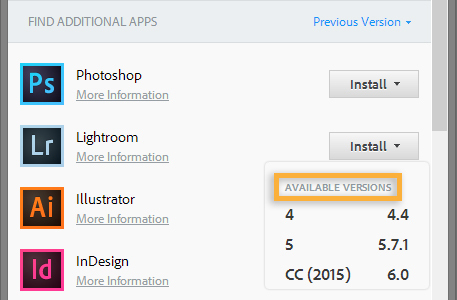 You can download previous versions of Lightroom, such as Lightroom 6, directly from the Creative Cloud desktop app. You can have multiple versions of Lightroom installed on your computer at the same time, if you choose. If you purchased Lightroom 6 as a Single App license, and not as part of Creative Cloud, please refer to Download and install Lightroom 6 (Single App license). Click the Creative Cloud icon, located in the taskbar (Windows) or Apple menu bar (Mac OS), to open the Adobe Creative Cloud desktop app. If it’s not already selected, click the Apps tab at the top of the window. In the Find Additional Apps section, click the Photography filter and choose Previous Version. Find Lightroom in the list, and click the Install menu. Choose the version you want to install from the drop-down menu. Your new app downloads and is installed on your computer. Previous product versions do not overwrite existing versions. You can have two versions of the same app running simultaneously on your computer, except for Acrobat XI (Windows) and Acrobat DC. Installation of these Acrobat versions will uninstall other versions of Acrobat. For more information, see Download Acrobat products.